Banned by the Soviet authorities, Shostakovich's 1930-1931 ballet score for "The Bolt" is a tale of slovenly work and sabotage in a Soviet factory, and is the source of this delightfully playful dance for brass quintet. Contains the score and sheet music parts for 2 trumpets, french horn or baritone, trombone and tuba. 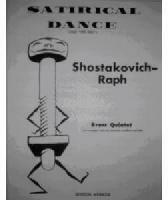 What do you want to know about Satirical Dance from "The Bolt" by Shostakovitch, for brass quintet?